Looking for private in-home or in-studio Trumpet lessons? Our Fountain Valley teachers are ready to get you started. Find your teacher today! Check out some of our most popular teachers near Fountain Valley, CA including Los Angeles, Long Beach, Irvine, Glendale and Burbank. Learn all styles of trumpet from a fundamental perspective. Performed on THE VOICE, AMERICAN IDOL, & more. 21 yrs as a professional trumpeter, the past 10 in Hollywood. Ear Training, Sightreading, Music Theory, and Harmony are all essential parts of mastering any musical endeavor. Your instrument is merely the voice by which you express your musicianship. HURRY - I only have room for 8 to 10 students! I've performed on THE VOICE, AMERICAN IDOL, GREASE LIVE! & others. My music has been featured on NBC, ABC, CBS, and domestic & international films. I've coproduced KRISTIN BELL, JEFF DUNHAM, WANG LEEHOM, & LINYU CHUN. I received undergraduate training at BERKLEE COLLEGE OF MUSIC (BM) in Boston where I studied with Tiger Okoshi, Charles Lewis, John Bavicchi, Richard Davis, & Gregory Fritze, and was a Graduate Assistant at the HODGSON SCHOOL OF MUSIC at UGA (MM) where I was a protege of the late Fred Mills (1935-2009), founding member of the Canadian Brass. Knox is an incredible person and teacher. In addition to his education, he has a lot of real-world experience. His lessons are fun and full of informative, practical knowledge. Highly recommend! Knox is a great musician, great teacher and all-around great guy! Knowledgeable and friendly. Highly recommended! I got better with just one lesson! He opened my eyes! I studied with other trumpet teachers for years and didn't learn as much! Try a lesson with him! Learn to play the trumpet! Students will learn to develop properly formed embouchure, efficient breathing, breath control, posture and diaphragm support, note fingerings, and develop valve technique, learn and develop proper tonguing and lip flexibility. Both classical and jazz lessons available. Ryan L. is a local composer, conductor, musician and musicologist. He holds a Masters degree in Musicology from California State University, Long Beach Cole Conservatory of Music. He is a professor of music at Woodbury University where he teaches a course in Music and Film. Additionally he is also the music director for Conundrum Theatre Co., Burbank Community Theater and Santa Ana College where he auditions, and rehearses singers, and the contracts and conducts the orchestra in all musical performances for the community. As a classical/jazz trumpet player he has performed with tournament of Roses Honor band, the Pasadena Pops Orchestra, the Crown City Symphony and in various musical theater productions. He performs regularly with his jazz band the Crown City Combo in various venues in the greater LA area. composition Ryan is an avid composer, composing for various genres and ensembles. Among these genres Ryan’s specialty is composing new musical theater works/songwriting. In 2010 he joined the Academy of New Musical Theater and with that organization he composed his first musical theater piece Shoot Ma! which premiered at the Colony Theater in Burbank. In 2011 he composed his second musical Experience Magic! A Musical Within a Magic Show, which premiered at the Sierra Madre Playhouse in 2012. Excellent at giving pointers and exercises to help students improve sound quality. Patient, positive and personable. Fabulous teacher! My son's taking beginning trumpet lessons. Ryan is patient, attentive, encouraging, and knowledgeable. Ryan is punctual and flexible when rescheduling needs to be arranged. He responds to email, phone calls, etc. in a timely manner. My son enjoys learning from him. It's a pleasure to have him as my son's teacher. An instrumentalist since age 10, Thomas has experience as a performer and teacher. 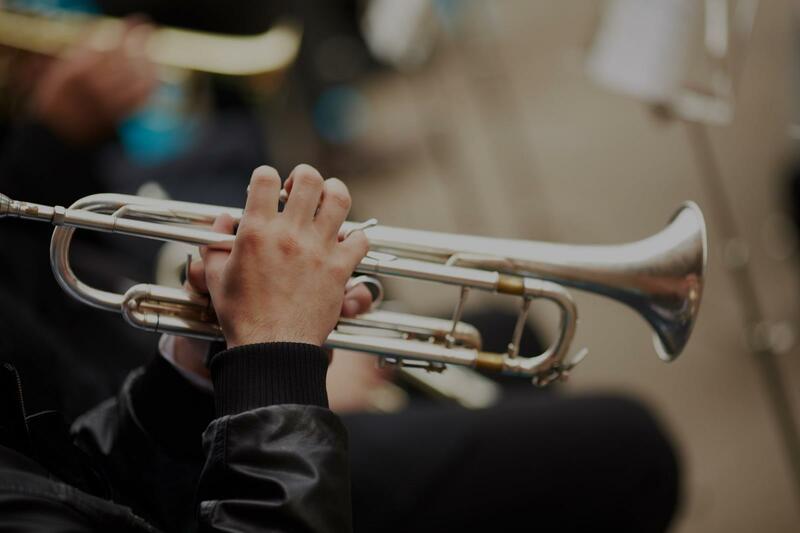 His previous education has included methodology classes on teaching specific instruments, and he is available to teach beginning trumpet lessons. Having played in groups like Wind Ensembles, Orchestras, Quintets, Jazz Ensembles, Brass Bands, Combos, etc., I can and will teach any and all styles from beginner to advanced levels. I will push you as hard as you want to be pushed from your lessons, and can help you become competitive in auditions for jobs, gigs, honor bands, and school. I have a methodical approach to the instrument which includes not only the physical aspect of the trumpet, but the mental aspect, which is largely ignored. I recently graduated from UCLA with a Bachelor's degree in Music with an emphasis on trumpet performance. I'm currently teaching and working with my time between now and when I begin a Master's program. I am also a trumpet player in the Army National Guard, and am very active with gigs and playing taps with the Army. Aaron is a great teacher! I enjoyed my lesson today with him and look forward to my other lessons! As an instructor Aaron is outstanding. He's professional and has impressive attributes being a UCLA grad and participating member of the armed forces; but more so, he's encouraging to his students and in our son - he positively encouraged a passion for the trumpet and a high regard for music in general. I love to play music instruments. I am about between intermediate and advanced with violin.flute and cello. My main purpose to learn trumpet is to play trumpet solo in christmas music at church. (lots of needs but so rare to see good trumpet solo specially amomg asian. I have a problem to get into this booking. Please anybody give me a call or email me. Trumpet is the most physical instrument that requires your whole body to work efficiently. Understanding the breath and how to relax the body goes a long way in learning the trumpet. Anyone can learn a musical instrument. I started from a blank slate which through my own interest was able to improve my skills to perform the music I love. Our son has really enjoyed Matthew's approach, who has been very patient and positive! As a performer I have played in the Los Angeles and Orange County area for the past 3 years as a member of big bands, jazz combos, and 4 piece brass ensembles. I have taught in both one on one settings as well as full ensemble classes and have seen great progress and success in my students in each. Overall my focus in teaching is on sound quality, technique, and stylistic relevance. My name is John. I am a graduate of the music performance program at The University of California at Riverside. There I studied under several talented teachers including Dr. Tim Labor and Dr. Barbara Bennett, as well as Trumpeters Don Clarke, Richard Chasin, and Joshua Welchez. Since graduating I have been engaging in some freelance work both as a one on one private instructor, as well as a technician for Azusa High School's Jazz Ensemble. lt. More than anything, that progress and achievement is my goal in teaching. I think that there should be a little more of note testing and learning because without learning the notes, it’s hard to play without knowing how to read the notes. But other than that, everything’s good. We'v been very happy with John. He comes to our house and teaches and motivates my daughter. I have been teaching Trumpet for 2 years, I am a college senior with one more semester. I Specialize in growing beginner to intermediate players and intermediate players to advanced players. Lessons are customized to the needs of each student. Students will all grow to understand music theory, become better readers, Improved technique, and richer tones. Let's get started. I am a professional trumpet player. I have played lead trumpet with the Jimmy McConnell Super Big Band, Lead player at Biola University Jazz ensemble. Principle in Biola Universities orchestra and wind ensemble for 2 years. I am Currently finishing up my Bachelors of Music in Performance at Biola University. My trumpet students should expect to improve weekly in instrumental techniques, range, sight reading abilities, soloistic playing and endurance. students will also receive musical theory information regarding literature the student is working on. Jonathan is a very good and knowledgeable instructor. He is patient and works well with me as i am a novice for bass guitar. I look forward to his assistance in my bass journey! Ever wonder why your favorite trumpet players sound the way that they do? Music is all about a healthy balance of strong, focused fundamentals that then facilitate the expression and artistry that made us all fall in love in the first place. Effective, concise practice is my specialty and I can help all players, old and new, adjust or create their own routines, learn to play just like their favorite artists, and develop their own sound as they move forward with music! There are many fantastic players out there in the world, but being a great teacher takes more than just good playing. While I've had experience playing in Los Angeles with schools, as a side musician, and with my own band- my passion for teaching and helping students grow is truly what I'd like to sell to you. I am working on my Bachelor's of Music in Jazz Studies and have studied with some phenomenal players/teachers that had a true passion for teaching music. Dr. James Ford III from CSULA who plays is the Grammy Award winning group the Clayton Hamilton Orchestra, Mike Cottone, a Monk Institute alum that most recently toured with the Eagles, and Kevin Brown a fantastic classic trumpet player that played with the LA Phil for two years. assion to our lessons for a fraction of the price. Can't find a teacher in Fountain Valley, CA? "Knox is the best! He can demonstrate anything and explains things very well. Seems like a cool guy too, very straight ahead. Los Angeles, CA teacher: Knox S.
"Very nice, and super knowledgeable! Definitely recommend!" Los Angeles, CA teacher: Antonia B.
each week. She is also an amazing musician herself and plays her instrument side by side with my son which allows him to hear and learn the individual notes." "Today was Eli's first trumpet lesson with Antonia. Antonia was super patient and helped him with some difficulties he was having." "Awesome teacher! My daughter loves her! She fills in the empty spaces her marching band coach doesn't teach!" "Great teacher my grandson is learning alot😊"
Los Angeles, CA teacher: John G.
"Jacob felt very positive about his lesson today. Beckie assured him that they could work on everything he's wanting to do." "Verry good person,verry good teacher,paisont and caring.verry professional"
Los Angeles, CA teacher: Thomas K.